Martin Lawrence plays his usual immature, loud-mouthed clown in "Rebound," an underdog sports comedy for kids so predictable that director Steve Carr doesn't even bother with scenes of its basketball team of 13-year-old misfits discovering their skills and a love of the game. He just assumes you know the formula and keeps the movie's focus on Lawrence, playing an egomaniac coach who is booted out of college ball for his temper and can't get a job anywhere except back at his old junior high school. A fundamentally unappealing jerk whose redemption comes with an even shorter and less convincing story arc, coach Roy McCormick ignores the kids one day -- pouting about his downfall on the sidelines as they lose a game 84-0 -- then the next he's become a life-affirming altruist full of feel-good advice and game-winning strategy, just because the script says so. 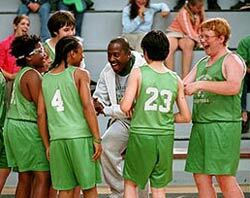 Even more problematic is that while "Rebound" is aimed at children, the one-trait tweenagers he's teaching to play the game are barely characters at all, save Tara Correa ("Judging Amy") as a stout, scowling girl bully McCormick recruits to intimidate other teams. "You got five fouls," he advises her with a wiseacre wink. "Don't be afraid to use 'em." Somehow this sloppy, mechanical movie (even the minimal game scenes lack vibrancy) manages to dig up some energy and spirit in the last act, which keeps it from collapsing under the weight of its own ineptitude. Kids may like it, not knowing enough to recognize its failure to relate to them, and accompanying parents won't want to claw their eyes out. But it's clear that while Carr ("Daddy Day Care") seems comfortable with Lawrence's utter insincerity as an actor, when he has real talent right in front of him, he doesn't know what to do with it. "Rebound" co-stars Megan Mullally ("Will and Grace") and Patrick Warburton (best known as Puddy from "Seinfeld"), but they're completely wasted in roles as a near-humorless school principal and a blandly bellicose rival coach.